This election, I’ve been trying an experiment, judging journalism from a different perspective, from the outside, as a member of a community and a partisan. I don’t like what I’m learning about my profession. We journalists tend to separate ourselves from the public we serve. We call ourselves objective, to distinguish us from the opinionated masses and to enable us to rise above their fray. We fancy ourselves observers, not actors, in the dramas we chronicle. I’ve argued that we must end that separation and learn to empathize with the needs and goals of the communities we serve, even considering ourselves members of those communities. Thus, social journalism. But in this argument, the journalist is still the journalist. Then I found myself in a position to look at the field not as a journalist but as an involved participant in a community. That community: Hillary Clinton supporters. I haven’t been a reporter or editor in years. I have been a loudly opinionated blogger since 2001, transparent about my political views and votes. I made it clear eight years ago that I voted for Clinton and then for Barack Obama. So there’s no surprise in telling you that I would vote for Clinton now. But this time, I decided to become politically involved. 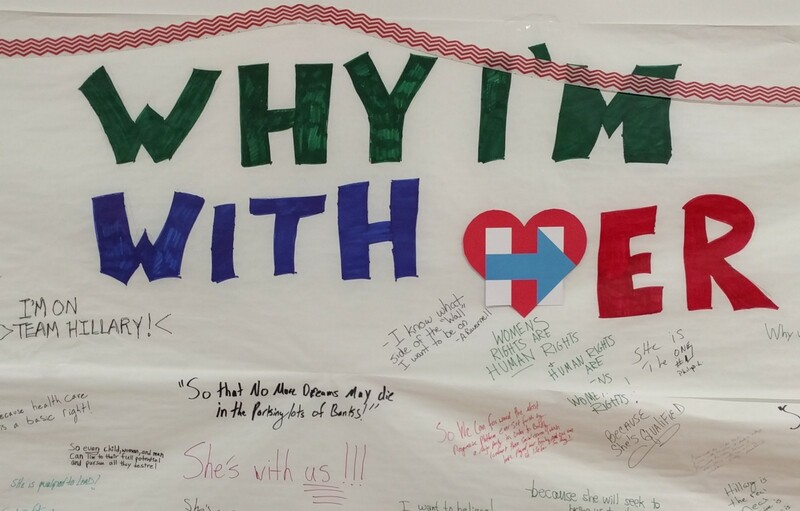 I bought my Hillary hat, went to a few campaign events, contributed to the campaign, made my support abundantly clear on social media, and a week ago volunteered at the Clinton office in West Philly, registering voters, driving others doing the same, and briefly canvassing a neighborhood so I could talk with voters. These are things journalists have never been allowed to do. Some people tell me every day on Twitter that I should not be allowed to do these things now. I disagree. First, #ImWithHer. Full stop. I want to be clear that I am enthusiastic about Clinton’s candidacy. I am not voting for her as the lesser of evils. I am not just voting against Donald Trump. I am not voting for her in spite of all the reasons media give not to do so. I am voting for Hillary Clinton because I respect and trust her intelligence, experience, policies, and good will. I tweeted 25 reasons (and counting) #WhyImWithHer. Second, I am voting against Trump and actively opposing him because I see a moral imperative to do so. As Jay Rosen said in my dotNYC podcast, Trump’s candidacy approaches a civic emergency. As Univision’s Jorge Ramos said in Time: “It doesn’t matter who you are — a journalist, a politician or a voter — we’ll all be judged by how we responded to Donald Trump…. And neutrality is not an option.” This is my generation’s “What did you do in the war, Daddy?” Still, I’m not hiding behind any Trump exception to the journalistic canon, arguing that this year is special. If Clinton were running against a reasonable, human, patriotic, unbigoted, smart, articulate, decent, mature, experienced opponent, I’d still be her passionate, open supporter. My third reason — a fringe benefit of sorts — is that I’ve wanted a better understanding of journalism from the public’s perspective and I finally saw I could not do that unless the coverage mattered to me, unless I took it personally. I also realized that this meant I could no longer claim to be standing removed, as the disinterested critic. Some years ago, when I spoke on a panel at the Online News Association, an editor came to the mic complaining about my use of the term “citizen journalism.” She cried (choking back real tears): “I’m a citizen, too.” Then act like a citizen, I said; be a part of your community. Many years later, I decided to take my advice. Journalism is a lousy mirror. I’ve been able to use Twitter to call journalists on this failing. When The Post’s Post’s Chris Cillizza labeled Clinton a “deeply flawed” candidate on CNN once too often, I tweeted a challenge and, to his credit, Cillizza answered. He said polls show that two-thirds of Americans don’t trust her. But compared to whom? Four-fifths of Americans don’t trust journalists. When media keep hammering again and again how untrusted Clinton is, couldn’t that become a self-fulfilling prophecy? [P]ublic opinion no longer refers to opinions being expressed in public and then recorded in the press. Public opinion is formed by the press and modeled by the public opinion industry and the apparatus of polling. Today, to get ahead of the story, polling (the word, interestingly enough, from the old synonym for voting) is an attempt to simulate public opinion in order to prevent an authentic public opinion from forming. With the rise of the polling industry our entire understanding of the public went into eclipse. This is also why I am fascinated by the death of the mass-media business model, the consequent death of the idea of the mass, and the impact this has on institutions — the press, government, politics, advertising, brands, schools— which depend on speaking to and swaying the mass. The mass is dead. Long live communities. My community of Hillary Clinton supporters is unheard and unseen. But that’s by no means the best example of journalism’s faulty mirror. Because of this election, we now know that the media has done a terrible job of reflecting the concerns and goals of underemployed, angry white men in the heartland. If media had done a better job of reporting — and then informing — their worldviews, would there have been an opening for them to be recruited by Trump and the forces of the so-called alt right? In this election, I am not a mass. I am not a poll number. I am not a color on a map. Neither am I a journalist. I am a member of a community I cannot see and hear in media. I am frustrated. The news chases squirrels, calls them rabid, and shoots them. Every damned day, news organizations scan the horizon for any distraction they could call a scandal — squirrel! — and, finding none, they just dredge up yesterday’s road kill and repeat it all again, over and over, asking the same questions that are so obvious as to be rhetorical but that nonetheless fill hours of airtime. Is Hillary Clinton a bigot because Donald Trump says so? they ask. Did TV’s anchors even consider what an insult that is to the 91 percent of African American voters who support her vs. 1 percent for Trump? Can’t our commentators see Trump’s trick: that he projects onto Clinton every failing of his own? He is crooked, so he calls her crooked; he is unhinged, so he calls her unhinged; he is a bigot so he first calls her a bigot. But the press treats each new attack as news to be debated. Seriously? I know I’ll get scorned for this, but I say Clinton’s email scandal isn’t a scandal. It was a mistake. Yes, I believe that she never knowingly sent classified information. Of course, she didn’t. In any case, where her email sat is less important than every issue facing the American electorate. I’ll get trolled for this, too, but the Clinton Foundation story isn’t a scandaleither. The Foundation does good work, and as James Carville says, someone will be going to hell for cutting off that good work. The Associated Press’ recent effort to find its scrap of squirrel meat in this story was an appalling example of journalism corrupted by the hunt for traffic. It is fine and necessary to ask the questions the AP asked but then, finding no quid pro quo, no smoking gun, why still report the innuendo of the question? I am utterly unconvinced by AP executive editor Kathleen Carroll’s defense of it. Of course, Secretary Clinton met with Melinda Gates and Muhammad Yunus; people line up to meet both of them every year at Davos because they are important people who do important work and, like the Clintons, they both raise and donate funds and find partners to help meet their worthy goals. That’s how the world works. I’d have thought world-wise journalists would be wiser about that. Amazing how they can turn off their sophistication when convenient. Balance: These faux scandals become tokens in journalists’ well-documented insistence on finding balance. Let’s spend one block of our show talking about how Donald Trump demonizes Mexicans and Muslims and — because we need something to “balance” that — let’s spend the next block repeating the same, year-old allegations about Hillary’s damned emails. The hunt for balance is especially cynical this year, as any attempt to give balanced coverage to an unbalanced candidate can only mislead. Savvy: Journalists use these stories and their impact to try to feed their political savvy, as Jay Rosen has pointed out for years. They want to sound like — no, they want to be — insiders who can predict every political outcome. I’ve been particularly struck this season how both commentators and reporters talk about what a candidate “should” do to win. When was that the reporter’s job, to advise on political strategy for politicians? Do they want to declare themselves partisans? Then they need to declare sides. Distraction: The real problem, of course, is that these squirrels keep journalism from doing its real job, which is to say…. If journalism as a whole had done its job informing the electorate in the U.K., I believe there would not have been Brexit. If journalism had informed and educated the American electorate, I am confident there would have been no room for Trump to spread his virus of ignorance, lies, and bigotry. It is patently clear that journalism is doing a terrible job informing the public. Judge the results. This is what depresses me most and makes me realize more than ever that we must rethink and reinvent the very core of journalism, its relationship with the public, its forms, and its business models. For it’s the business model that makes Les Moonves at CBS and Jeff Zucker at CNN rub their greedy little hands in glee at the audience and revenue the Trump Circus brings them. It’s the business model that has newsrooms chasing rabid squirrels and outrageous Trumpisms to get more volume, less value. It’s the form of journalism — the scoop, the exclu, the provocative TV yelling match, the savvy political roundtable— that brings out our worst in political opportunism and sensationalism, leaving no room for substance. And because we in journalism separate ourselves from the public we serve — sitting above them, in judgment — we try to argue that it’s not our fault if they’re not informed. Because of that separation, we cannot credibly contend that we know what the public’s concerns are; we’re not good at listening. And because of that separation, we still expect people to come to us for the news, when we should be going to them wherever they are. Imagine if even a fraction of the time we see wasted on cable news were devoted to educating the public about the issues and realities of immigration, refugees, criminal justice, the economy, infrastructure, education, health care costs, entitlement costs, security, the environment, taxes, jobs…. When was the last time you saw TV news do that? How much of any news organization’s work is devoted to doing this, to informing the electorate? Shouldn’t we ask before assigning every story and booking every TV discussion: How will this help the public better decide how to vote? Journalism is failing the nation. This election is the proof. Since I’ve declared myself a member of the community of Clinton supporters, I also have standing to criticize the campaign. If the campaign were run more as a grass-roots effort — à la Dean, Obama, Sanders — then it would be easier for the journalists to find and report on the enthusiasm I have seen myself. I can now speak from first-hand experience about how difficult it is to get involved in the campaign in person and online. If the candidate did a better job addressing the damned email story from the start, maybe — maybe — we wouldn’t be bombarded with it every day. If the foundation and family were more aggressive in sharing news of what the foundation does then it would be less of a target for squirrel hunters and more of a character statement in her favor. If the candidate gave more interviews, there’d be less whining among the journalists about her not having a press conference (not that press conferences ever do a great job of informing; interviews are better because they allow for followup). And — this is going to sound trivial but I mean it — if the campaign didn’t take a full month to ship the Clinton-Kaine bumperstickers, then we’d be seeing them on more cars and it would be more apparent to the journalists that there is a community of Clinton supporters out here. As I was writing this, I spoke with one of my deans and he pointed out that all my complaints have been the fodder of academic critics of journalism for decades. They are outsiders. It has helped me to be the outsider so I could judge journalism as a user. That these problems continue and perhaps get worse as news companies get more desperate (“We need more traffic! Throw more squirrels on the fire! We need to save money! Fire more reporters!”) is only cause for deeper professional angst. What could save journalism from uselessness and society from the consequent stupidity and ruin? We bloggers thought we would topple the gatekeepers. Blogs did allow more voices to be heard and social media did enable debate. Then again, blogs led in a straight line to Breitbart and Twitter to Trump and we know where those lines crossed. And as I noted in my Gawker death notice last week, the death of the mass-media business model might mean the death of blogs, too. What stops me from quitting and sustaining myself on road kill or PR? My students. I tell them they must reinvent journalism. When I spoke with our incoming class last week, I came away inspired by their innovation (in a design exercise, none of them invented a magazine or a web-site filled with long-form writing) and their aspirations (I will once again quote the definition of journalism from student Kate Ryan: “It is a means to inform the public and, in doing so, cultivate an educated, empathetic, and engaged society”). Does our political journalism inform and cultivate an educated, empathetic, engaged society? It fails on all counts, wouldn’t you agree? Could it ever do all that? Ever the optimist, I will say yes. It must. But we have to throw out our well-worn reflexes and assumptions and start over. Do we need to destroy the news to save it? People think that’s what I’ve been saying for years, but I wasn’t. Until now. We must create a journalism that mirrors the many and diverse communities and concerns in societies and convenes these communities in dialog so they can foster empathy and understanding. We must create a journalism that educates the public about the issues that matter to each other (so we must start by asking them what matters, not assuming we know). We must create a journalism that does not reduce people to numbers and colors but instead invites them into a substantive, intelligent, fruitful, and civil discussion as individuals and members of communities, not a mass. We have so many new tools to do all that. That’s what I tell my students; they are our last, best hope. Here is AP Executive Editor Kathleen Carroll defending what I believe were a seriously flawed story and tweet about some of Clinton Foundation donors Hillary Clinton happened to meet with while Secretary of State. I bring this clip to you because it contains — as my friend Jay Rosen would say — specimens for study, two specimens revealing the difficulty classical journalism has adapting to a new media ecosystem today. Editors love to tout news judgment as a key value that journalists add to the flow of information in society. What is the AP’s news judgment here? How important is this story? Somewhere between interesting and the end of the world: You decide. Stelter shows Carroll how Donald Trump & Co. were exploiting especially the AP’s deceptive tweet promoting this story. Once the rockets are up, who cares where they come down? That’s not my department,” says Wernher von Braun. In other words, the AP found no evidence of quid pro quo, no smoking gun, nothing here that was wrong, no rock-solid reason to cast aspersions, no real conclusion. But they went with the story anyway because of the impression people might have — an impression the AP’s story gives them. Yet remember that Carroll says she “can’t be held responsible for the way that everybody thinks about and responds to” this story. Does not compute. We most certainly need to look at the impact our work has, not only in how interested parties exploit it, not only in how the public interprets it, but also in how effective it is in performing our key job: informing the public. Was the public better informed after this story? Did this story give people the information they needed to decide how to vote for President? I would say no. As Stelter said, the AP took what it could get with its Freedom of Information request and tried to make an article out of it. Because that’s what we do. We make articles. That leads us to our second specimen: the tweet and Carroll’s discussion of it. BREAKING: AP analysis: More than half those who met Clinton as Cabinet secretary gave money to Clinton Foundation. The key problem here is that the AP is discussing only 154 meetings out of more than 1,700 Clinton held as Secretary of State, according to her campaign manager. Thus the AP’s math — that 85 of the 154 meetings, or more than half, were with foundation donors — is wrong, deceptive, and irresponsible. The real proportion is more like 5 percent. On Reliable Sources, Carroll says the tweet linked to the full story. I can’t find anything to click on in that tweet, can you? Does that mean you regret it? Stelter asks. Thus she is saying that sloppy imprecision is good enough for Twitter. Nail that to the museum wall. In Carroll’s view, then, Twitter is merely an advertising vehicle, a means of promoting the AP’s real work: articles. She does not see it — or, one presumes, the rest of social media — as another form of reporting, another means of informing the public. What have we learned about classical journalism in this age? We see that classical journalists think it is their job to make good stories. I would argue that our job is to inform the public. Classical journalists say their work ends when they produce their stories — they aren’t responsible for what comes next. I say we should always ask why we are are reporting what we are reporting and what our impact will be. At least at the AP, classical journalists say they want to get readers to their stories. I say it is our job to take journalism — reporting, investigation, facts, context, explanation, impact — to the public, wherever they are, in whatever form necessary. Even on Twitter. Kathleen Carroll is stepping down as the AP’s editor soon. I honestly feel sympathy for her having to end her tenure with this, trying to defend old journalism in a new world. I agree. But this also should make the AP ask what kind of executive editor it needs next, an editor who can rethink what the Associated Press’ job is in an age when we can inform each other (we are becoming our own wire service), when the AP can inform people in so many new ways, when bad actors can use the AP’s reporting for their ends, when the standards of journalism — bringing facts, correction, understanding, context, investigation and other classical journalistic values — are more needed than ever. I remember clearly, in Gawker’s early days, when my old friend Nick Denton insisted that what his new blog was producing was not journalism. He didn’t want to come speak at a journalism school. He refused to hire journalists, as they’d already been ruined for Gawker’s work. But yesterday, in his eulogy for the devil baby he birthed, Nick draped Gawker’s casket in the flag of Journalism, waving the words journalist, journalism, and even journalismism 27 times. Sorry, Nick, but maybe you were right the first time. Don’t worry: I’m not about to launch into a J-schoolmarm scold about about Gawker violating journalism’s ten thousand commandments. No, I’m going to use this as a teachable moment to ask: WTF is journalism now? After Gawker. On the internet. In the age of Trump. I had the honor of spending last week with our impressive incoming class at the CUNY J-school, trying to help them put journalism — their coming months of classes and their careers thereafter — in the context of history, business, and our role in society. I asked them each to begin by defining journalism. We discussed many thoughtful insights, including the idea that journalism exists to “cultivate an educated, empathetic, and engaged society.” We also discussed one definition that might as well have been Nick’s in his remembrance: that it is the journalist’s job to disrupt the status quo and bring down powerful institutions or people. That is certainly a common view in the profession. Once having done our jobs afflicting the comfortable, do we ever ask, “What then?” Is it journalism’s job just to expose and destroy? Or to build and improve? Should we ask the same question of the net today: Is it the purpose of blogs and now social media to upend? Or to progress? Why are we here? Why do we bother? We hoped blogs would democratize media and allow people to make real connections via the Web. We feared that power would accrue to a handful of sites or writers; that this small group of people would talk among themselves and exclude others; that eventually, inevitably, what we considered an art (sort of) would be degraded by commerce. Yes, basically all the bad things came true. Now I wonder whether the death of Gawker — not to mention the departure of Arianna Huffington from Huffington Post — signals the super nova of blogs and everything we held dear and every ill we caused. I don’t say this from atop a pedestal. In my day, I was down in the blogging trenches, snarking along with the rest of them. I had my share of feuds and fits. You could say I damned near brought Dell down. That all seemed like fun until it wasn’t. Now I long not for the return of the gatekeeper institutions, only for a path to civility. There was something downright proto-Trumpian about Gawker as it shifted from afflict-the-comfortable snark to take-no-prisoners drive-bys. In fact, these days, when Donald Trump really loses it and gets personal and goes absolutely nuclear on his targets — particularly when he attacks the family members of his targets — it’s hard for me not to think of the tone and tactics of Gawker at its worst. It is a means to inform the public and, in doing so, cultivate an educated, empathetic, and engaged society. Gawker did not have that ambition. In this election, cable news does not have that ambition. How much of journalism does? As I think about trying to save journalism, I ask first what we are trying to save. The answer can’t be snark, gossip, meaningless blather, and cruel destruction. We must be of value in people’s lives, helping them improve their communities and society. Or why bother? Therein lies the only hope of finding a new business model for journalism: raising it up, being of value. In Gawker, we also saw the implosion — the symbolic last gasp — of the mass-media business model, in which Reach Rules, forcing us to do anything (and I mean anything) to get more page views, more traffic, for more ads and more pennies. It would be nice to say that I struggled with the ethics of publishing the story, or that, even better, my maniacal and sociopathic boss pressured me into publishing it. But there was very little question in my mind: It seemed so naturally a Gawker story that I assigned it immediately. . . . I had gone out on the limb because I liked it out there. I liked being the villain, the critic, the bomb-thrower. If one of my bombs went off in my face, it was only my fault. Gawker no longer brought down the powerful. Gawker became the power to be brought down. Enter Peter Thiel. Native advertising: Another false messiah? I’ve been waiting for this: the leak in the native advertising balloon. Tablets were going to save the news business. Not so much. Paywalls were our salvation, damnit. Nope. Native advertising is our future. Think again. Digital ad sales intelligence platform MediaRadar said the average renewal rate for sponsor content this year is 21 percent. Meanwhile, native ad tech company Polar recently described renewal rates as “weak,” with 40 percent of the publishers it surveyed showing renewal rates below 50 percent. 1. The ROI is debatable. Says Digiday: “Behind the low renewal rates is the fact that advertisers are uncertain about the return they’re getting on native advertising.” This has been my worst fear. We give the advertisers what our standards and ethics forever forbade — confusing our readers about the source of content — and then the advertisers wake up and say, ‘Well, that was fun. But we’re bored with that. What can you sell us next?’ Except with badly done native advertising, we’ve already sold our brands, our souls, our seed corn. We have nothing left. Jack, you gave away our only means of support for what? Magic beans? I have long wondered whether native advertising would do what advertising is supposed to do: drive sales. What is the efficacy of replacing five-word banners with 500-word stories? Perhaps we are beginning to find out. 2. Competition is rushing in. Digiday: “Three years ago, there were about 15 companies helping brands produce sponsored content, according to MediaRadar CEO Todd Krizelman. Today, there are more than 600, and the number is growing.” I have long said that in media need to compete with creative agencies but we can’t imagine that they won’t fight back. Content is a commodity. Anybody can make it. That is the key lesson of the internet for media. So we surely couldn’t believe we’d hold onto the business of “telling brand’s stories” for long. 3. It’s expensive. It takes a lot of resources to make content for finicky advertisers. 4. It’s no longer enough to write a “brand’s story” and put in in our editorial space (barely camouflaging it as an ad). Media’s audience is insufficient. So media has to spend money (a) placing ads elsewhere to drive traffic to our native ads, (b) placing the native ads we make at other media sites, and (c) trying to buy social traffic. That, too, is expensive. So what is the profit margin on native advertising after we are left marketing our services to replace the clients who churn out, after spending a fortune on making native advertising, and after spending another fortune advertising the advertising? Native ad distributor Polar says it’s a high-margin business still and that’s good. But where do those trend-lines fall given the news above? Mind you, I am not against doing native advertising well. See Quartz, for example. I am in favor of media companies competing with ad agencies for both creative and media business. What I object to is the idea that this could have been our sole salvation, any more than our earlier magic beans, without embarking on the much harder work of reinventing ourselves. Our only salvation will be to question *everything* about our mass-media business models as we enter a new reality, starting with the value of reach in an age of abundance and endless competition. Yes, reach matters but only if we have something of value to convert all those folks to. We have to shift from reach to relevance, volume to value. We have to rethink the essence of what news and media are. That’s why I wrote this: to begin questioning and exploring. That’s also what I said to our incoming students at CUNY’s J-school last week. At the end of our week together, the students listened to voters about their needs in this election and their proposed solutions didn’t look like content-based mass media at all. They’re all journalists but they are learning to question their assumptions. We need to do the same with business people and reinvent what they do. Instead, we’re grabbing the deck chairs on the Titanic hoping they will act as flotation devices. Content.ly — a reputable native advertising company (with whom we are doing at study at CUNY) just released some further data on media’s behavior. 68% of publishers have editorial staff make native advertising. Nooooo! 45% think the biggest threat to native advertising is the lack of separation between church and state. Jeesh.